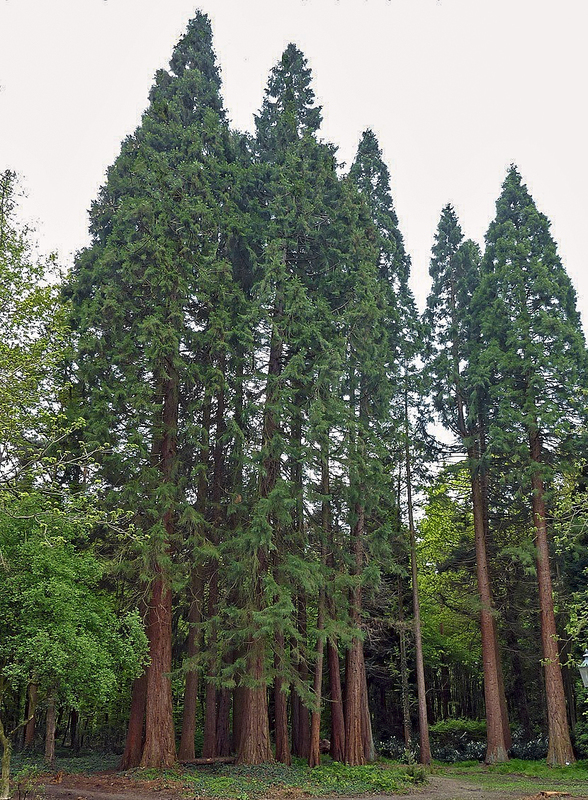 Like many Westerners, giant sequoias came recently from farther east. Of course, “recent” is a relative term. “You’re talking millions of years (ago),” William Libby said. The retired University of California, Berkeley, plant geneticist has been studying the West Coast’s towering trees for more than half a century. Needing cooler, wetter climates, the tree species arrived at their current locations some 4,500 years ago — about two generations. “They left behind all kinds of Eastern species that did not make it with them, and encountered all kinds of new things in their environment,” Libby said. Today, sequoias grow on the western slopes of California’s Sierra Nevada. Now, it may be up to humans to move sequoias and their close relatives, coast redwoods, to new homes. As temperatures rise and the world’s climate rapidly changes, many plants and animals may not be able to relocate fast enough on their own — including the Klamath Mountains’ Brewer spruce, which grows on windswept peaks, and the New Mexico ridge-nosed rattlesnake, which can be found marooned on just a few isolated mountaintops. But the prospect of mixing and moving species alarms scientists, because of the risks involved — both to the new ecosystem, and to the species themselves. Plants often move on the geologic timescale of landforms. After all, trees don’t simply uproot and stroll away from stressful conditions. Instead, whole populations shift, as individuals in one part of the range die out and saplings in other places grow. But ecosystems are changing on a human timescale now. That’s a problem for the West’s iconic giant trees. Coast redwoods, which are the world’s tallest trees, and sequoias, which are the most massive, are exceptionally adaptable: The oldest living trees have withstood cold spells, drought and fire. But today’s extraordinary rate of climate change — along with habitat destruction and fire suppression — may be too much for them to survive. “If we expect them to make a big migration in one century, that’s asking a lot,” Libby said. Populations of both sequoias and coast redwoods are dwindling, and the trees are already considered endangered by the International Union for Conservation of Nature. Scientists fear climate change could drive them to extinction. These trees are among the slowest travelers in North America, in part because of how they reproduce. Coast redwood seeds are moved by wind or rain, while insects and rodents move sequoia seeds. But few seeds germinate successfully. Instead, for the most part, clonal sprouts grow up from the shallow, stretching roots of a mature tree. In the case of coast redwoods, deceased elders can leave behind a “fairy ring” of surrounding younger trees, just a few feet from where the parent stood. In order to outpace hotter conditions, this gradual process may need a human nudge. While Westerners already relocate plants and animals — for species reintroductions, hunting, agriculture and more — there is still no consensus on rescuing organisms from climate change this way. In a 2006 opinion piece, two well-known ecologists, Anthony Ricciardi and David Simberloff, dismissed assisted migration as “planned invasions,” a “new bandwagon,” and “ecological gambling.” The risks that introduced species might pose to plants and animals already living in a region are too unknown, hard to predict, and potentially disastrous to be worth it, they said. They concluded that conservation biologists should focus on breeding rare species in captivity, restoring habitat and ending human-caused climate change. Past experiences with introductions gone awry make scientists nervous. In the 1940s, the federal government introduced buffelgrass, a drought-hardy African forage, to Arizona to help cattle survive dry spells. The grass spread, filling in the spaces between desert plants, replacing natural firebreaks with ready fuel and turning swaths of desert across the Southwest into fire-prone grasslands. In 2010, the National Park Service warned that buffelgrass covered about 2 percent of Saguaro National Park and was increasing by 35 percent annually. Few U.S. scientists have tried experimental assisted migrations, and in Canada and Mexico, the results of experiments have been mixed. In 2015, Canadian researchers studied Douglas fir trees that were moved more than 40 years previously throughout coastal British Columbia for reforestation research. They found that transferred trees sometimes did not grow as well as local trees, because they didn’t form symbiotic relationships as effectively with local soil and root fungi, which help trees absorb nutrients. Mexican researchers found that when they moved three species of Mexican pines to higher elevations and colder temperatures, two species struggled to survive in locations more than a few hundred feet above their current ranges. These findings speak to one broad concern about moving species around to save them: It can cause unnecessary suffering, eat up limited conservation funding, and ultimately fail. In one recent example, 11 black rhinos were relocated in Kenya. All 11 perished from salt poisoning, dehydration and, in one case, a lion attack on a weakened animal, according to the Daily Nation. Mary Williams, an ecologist who has researched assisted migration as a climate adaptation strategy, cautioned against the “extreme” movement of plants. She recommended instead that seeds be taken from the warmer parts of a plant’s existing range, to be grown in cooler parts of its range. Then, when those cooler areas warmed, the plants would already be adapted to the new conditions. Because a species’ resilience comes from its genetic diversity, spreading the clones or seeds of too few plants could also doom an assisted migration project. Connie Millar, a senior scientist with the U.S. Forest Service who studies how mountain ecosystems are responding to climate change, recommends mixing the gene pools of the trees used for assisted migration projects by collecting seeds and clones from different locations. “Then, natural selection 50 years in the future can sort it out, and we don’t have to predict (survivors), which we’re very bad at doing,” she said. Agencies in the U.S. have toyed with the idea of assisted migration, but no projects are currently in the works. To make tree transplants work, federal agencies would have to find the money for the prolonged follow-up work needed to keep them alive: artificial watering, fertilizer feedings, protective fencing to keep out hungry deer. “Just like in a garden, when you transplant, there’s usually transplant shock,” Millar said. “It takes a while for roots to get down. … It’s not like they’re happy all of a sudden.” Similar constraints would limit animal introductions. In many cases, for agencies, shifting species would also require new regulations, such as those that govern post-wildfire replanting. The biggest unknown about assisted migration may come down to human behavior: Without knowing how much fossil fuel people will keep burning, researchers can’t say for sure how much the climate will change, or where a particular organism’s optimal neighborhood will be in the year 2100. Now in his 80s, Milarch dedicated himself to saving these species — and many other imperiled trees — a quarter-century ago, after his own near-death experience. Milarch recalled an archangel turning him back from the gates of heaven because he still had work to do on Earth: He had to save tree species. So Milarch focused his fourth-generation nursery business on trying to conserve many of the world’s disappearing tree species through assisted migration. In many ways, this Noah’s Ark approach to conservation flies in the face of scientific understanding: In addition to planting trees far from their current range, Archangel also chooses the oldest, biggest trees — which Milarch calls “champions” — to clone, a sensible-seeming approach that actually masks assumptions about how those trees got that way. Sometimes, seedlings grow into strapping adults because of dumb luck: Maybe they dug into particularly rich soil, or it rained buckets during their first decade, or they happened to germinate near a gap in the forest canopy that let in lots of light. Clones of those trees may wither without the same help in a new location. Archangel tries to take genetic diversity into account by growing genetically diverse seedlings as well as sprouts cut from “champion” tree clones, but its collection overall still lacks the diversity of a natural population. Still, Archangel inspires volunteers around the world. Perhaps that’s because it offers hope, pulling believers into the boughs of ancient sequoias on climbing expeditions and insisting that concerned people can do their part to end climate change simply by planting trees. Maya L. Kapoor is an associate editor at High Country News.